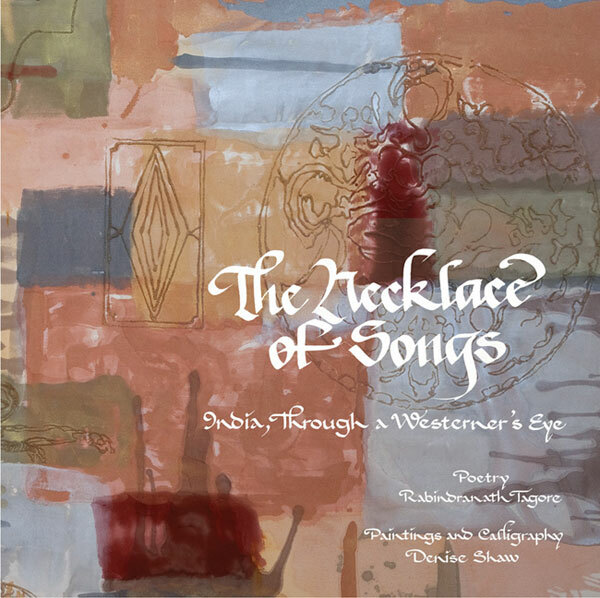 Limited edition artist’s book, signed and numbered by the artist. 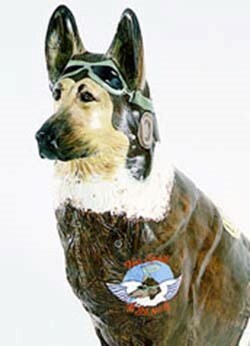 “America’s Tribute to Search and Rescue Dogs” is a public art initiative whose goal is to raise much needed financial resources for professional and volunteer Canine Search and Rescue organizations throughout The United States of America,” according to the American Kennel Club. 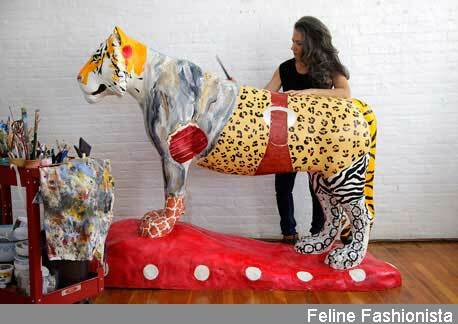 The dog sculptures patrolled the Manhattan’s streets August 2002. Easter is a time of renewal and rebirth. This is the theme living in the psyches of many New Yorkers in the wake of 9/11. 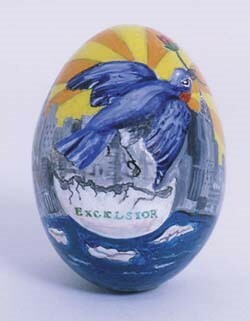 I have drawn a bluebird, which is the New York State bird, hatching from an egg shell. 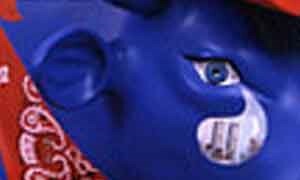 The bluebird carries in its mouth a red rose, which is the New York State flower. 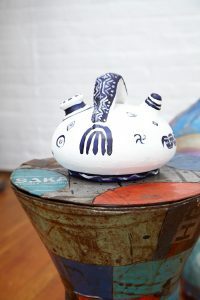 It can also symbolize love and paradoxically war. 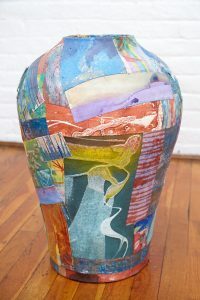 The bluebird is superimposed against the New York City skyline and the skyline in turn is against the background of the dawning of the sun’s rays. 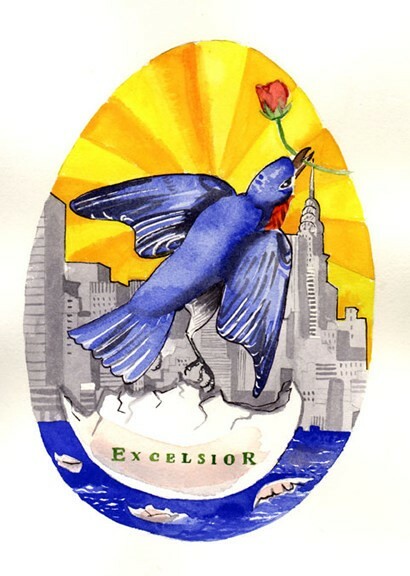 The rays were inspired by the sun on the New York State seal as well as the writing: “Excelsior” meaning “Ever Upward”. The clipper ship is also an element on the New York State seal, perhaps suggesting the early Dutch settlement and commerce. 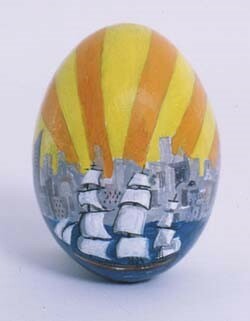 White House Easter Egg Acrylic and egg shell, 2.5″ x 1.75″. 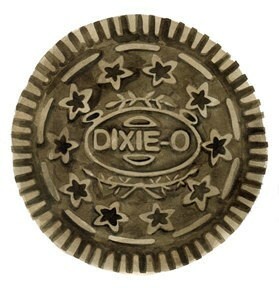 Included in the Dixie¨ “Art of the Plate” Exhibition at the Museum of Arts and Design, New York City, May 1 – June 3, 2003. 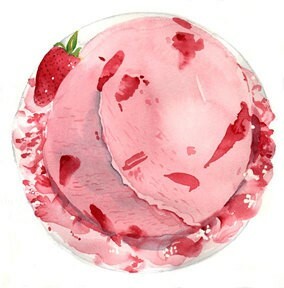 Strawberry Ice Cream, Watercolor. 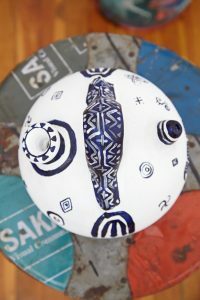 9″ diameter. 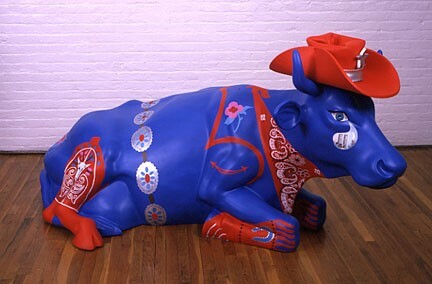 “Even Cowgirls Get The Blues” , Fiberglass polyester mixture, mixed media, acrylic. 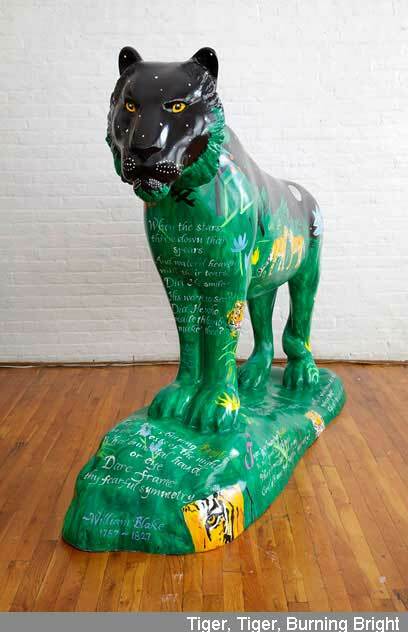 7’2″ long, 4’7″ high and 2’1″ wide. 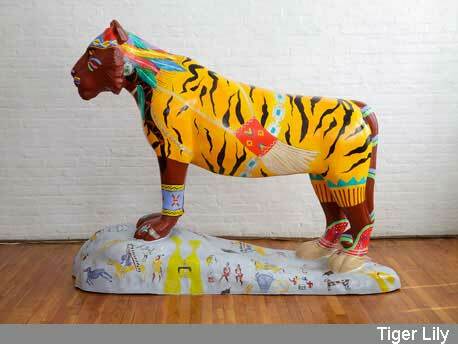 Tiger Parade is a public art exhibition that places life-sized fiberglass tigers, uniquely designed by host city artists, in the “urban-jungle” of city landscapes for the public to view. 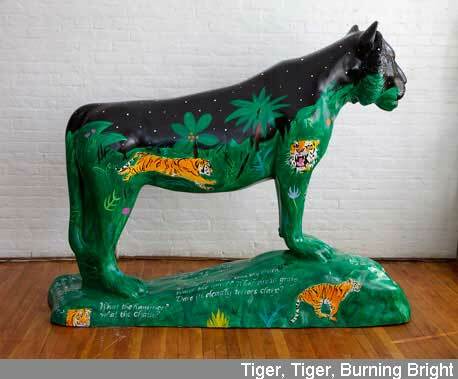 As the world’s largest premier public art event featuring tigers, Tiger Parade raises awareness of the species’ endangered status through the universally appreciated medium of art. 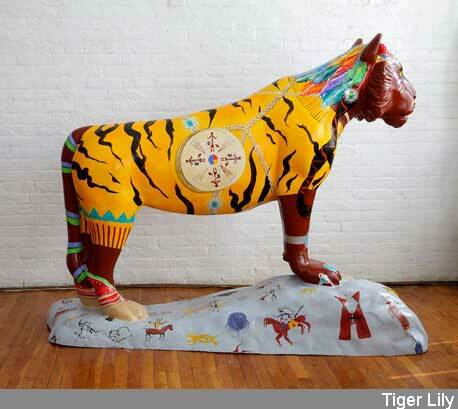 Tiger Parade reaches audiences globally, across cultural and lingual barriers, through large-scale public exhibitions displaying the tiger in all its majesty, as a commanding symbol of nature’s beauty and power. 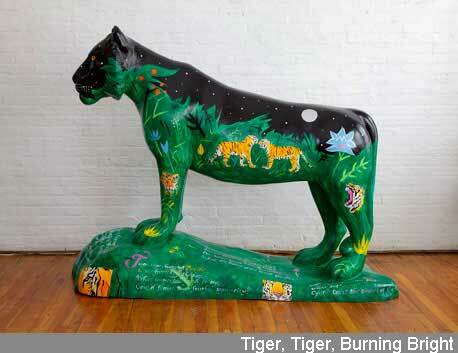 Through generous sponsors, millions are able to view the public art exhibition for free. 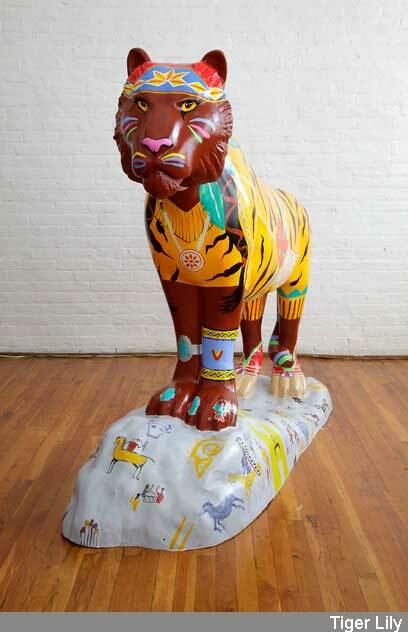 Proceeds raised from Tiger Parade’s auctions and merchandise sales go to benefit the Global Tiger Fund, which seeks to implement economically sustainable solutions to conserve the tiger’s natural habitat, thereby protecting the biodiversity needed to maintain the species survival.